Graceful vintage dress features a classic 1950s style swing shape with a slim design, a sleeveless cut, special three shoulder straps design, front bowknot tie and a concealed back zipper. Full of white polka dots on the bright yellow background are eye-catching. It is suitable for cocktail party, outdoors, and other occasions. Received promptly and we'll packaged. Beautiful dress made of lovely medium weight cotton. Fits perfectly. The only problem for me was that the outside strap slipped off my shoulders, but this was easily rectified by a few stitches joining all 3 straps at the top of the shoulder. 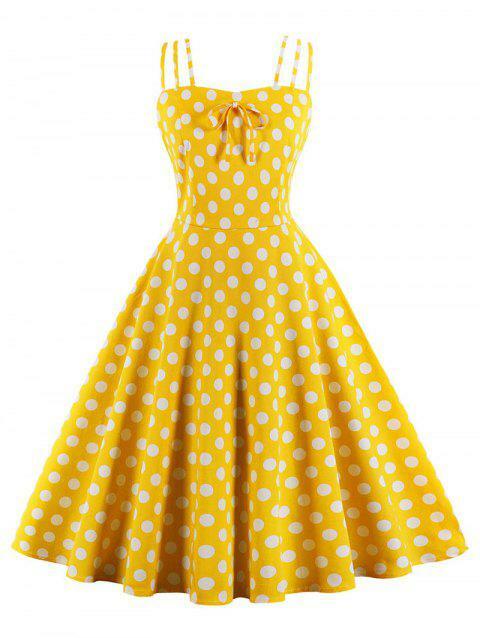 Q:I am interested in purchasing the retro spaghetti strap polka dot yellow dress .I am quite tall please could you tell me how long the dress is from the waist down to the hem thank you?